(TB30DP1) GeoCoins.net Trackable Token Geocoin - Todie's Wild Ride II: WATCH! Todie's Wild Ride II: WATCH! Use TB30DP1 to reference this item. 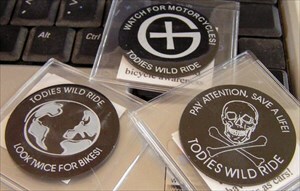 Gallery Images related to Todie's Wild Ride II: WATCH! No pic attached but it's still there. There was no picture attached. I will keep it moving.